Packaged Facts forecasts that U.S. retail sales of yogurt will approach $9.3 billion by 2017, up from $7.3 billion in 2012. Even with its recent market growth, in the U.S., yogurt continues to be consumed at a much lower per-capita rate than in other countries where yogurt is a staple. For more information on the Packaged Facts report, visit HERE. I believe this presents a unique opportunity for specialty and unique brands to create a point of differentiation and attract new users and new use occasions. At the same time, they can command a premium price. After all, those of us who have been in the dairy industry long enough remember the days when “specialty cheese” meant sharp cheddar. If you look back, the U.S. yogurt market is in a similar place as cheese once was before small niche players entered the business. Today, specialty cheese is a vibrant category, with consumers paying steep prices for innovative offerings. Emerging innovators in the yogurt business are carving out a niche and teaching consumers that yogurt can be as much of a specialty item as farmstead blue cheese made from grass-fed cows. 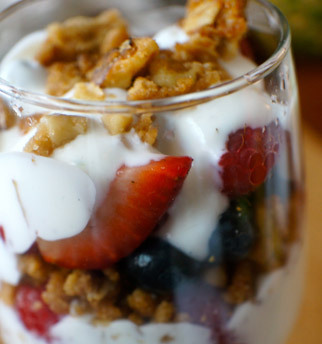 Yogurt appeals to consumers' growing interest in healthful eating. From nonfat to whole milk formulations, yogurt is packed with nutrients that consumers recognize as being better for them. This includes protein, essential fatty acids, vitamins, minerals and live and active cultures. 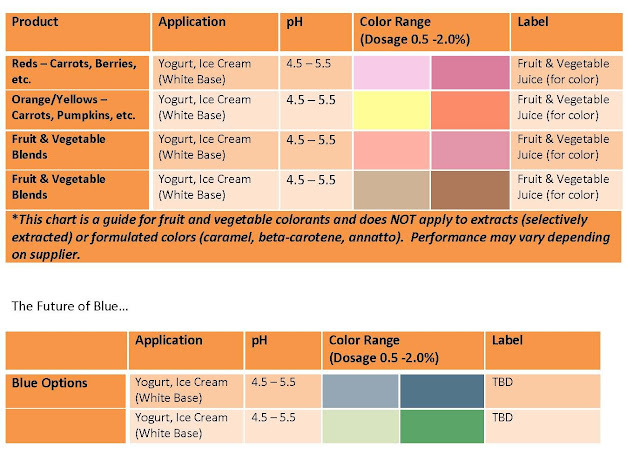 When it comes to flavor trends, Innova Market Insights tells us that fruit flavors still dominate the yogurt market. In fact, fruit flavors were featured in more than two-thirds of global launches recorded by Innova in the 12 months to the end of March 2013, rising to three-quarters of the U.S. total and nearly 70% in Latin America. This encompasses a wide range of different types of fruit, from more traditional strawberry and peach to more unusual such as papaya, damson and coconut. Plain, natural or unflavored yogurts are the second most popular option globally, featuring in about 12% of introductions, but again this varies, depending on regional and cultural preferences for plain yogurt, with levels rising to over 22% in Asia, but falling to less than 5% in the U.S. Brown flavors, such as chocolate and caramel, took third place globally, ahead of vanilla. According to my friend Lu Ann Williams, who is the director of innovation at Innova Market Insights, “The yogurt market is generally showing good growth, and this is reflected in terms of new product activity, where levels are continuing to rise globally. 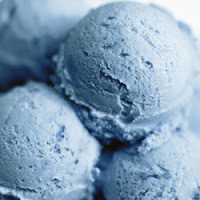 With an increasingly competitive marketplace, the need for product differentiation has led to developments in flavors over recent years, most notably into more up-market and complex options, often featuring a number of different ingredients, sometimes with formulations taken from other sectors of the market, such as desserts, bakery and confectionery.” She also notes that companies are trying to ring in the changes with increasing numbers of limited-edition and seasonal options. The split-pot concept has helped to move the level of flavor sophistication forward. This has allowed for the addition of sauces and purees, as well as inclusions such as chocolate, candies or mini-cookies, which can be used with plain or flavored yogurt to add further interest in terms of texture. Originally confined to dual-compartment pots, the market has now extended to include three-compartment pots, permitting wider options in terms of the number and type of ingredients that can be offered. For example, Ehrmann has been a leader in this area with its Almighurt Nach Herzenslust (for our Heart’s Desire) range, first launched in Germany in 2011 in a heart-shaped three-compartment pot. The latest addition to the range in 2013 is Zitronen-Käsekuchen & Knusperwaffeln (Lemon Cheesecake with Crispy Wafers) variant. This features vanilla yogurt in the main pot, and lemon sauce and crisp wafer pieces in the two smaller pots. On Thursday, September 26th, I had the opportunity to walk the floor of Expo East in Baltimore, MD. 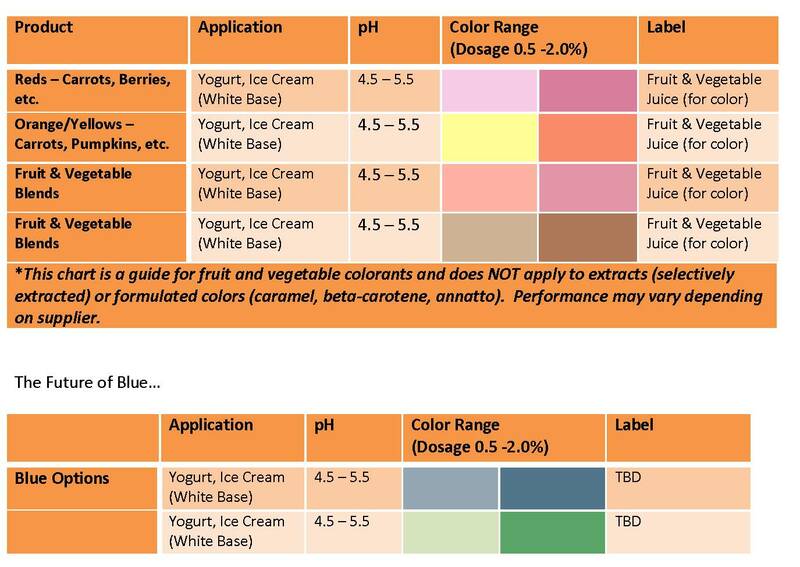 From numerous conversations with varied food and beverage manufacturers, including yogurt marketers, as well as my continuous tracking of flavor trends, I am very comfortable making the following flavor predictions for yogurt. Some of these are already appearing in the marketplace, as you will see in the 15 product lines identified further in this blog. Maple—alone or with another layer of flavor, either sweet or salty, as maple possesses both tastes, which makes it very complementary. Why maple? 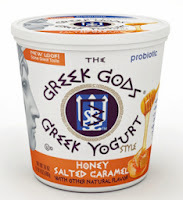 It’s a natural progression from honey being using as a sweetener and as a characterizing flavor in Greek yogurt. It’s also bolder than caramel, which remains popular, and thus appeals to consumers’ adventurous taste buds. Cinnamon—not necessarily alone, but with fruit or even maple! Cinnamon is a comforting flavor that possesses a healthful, healing halo, and also delivers some kick, not quite as much as one gets in a stick of Big Red gum, but still some kick. This is particularly appealing to consumers who appreciate Hispanic flavors. Ginger, same story as cinnamon, but with ginger, the association is with Asian cuisine. Cherry is the next berry. (When my husband proofread this, he declared, “Berry in dairy might be replaceable but “Berry On Dairy” is not. Thanks honey!) Cherry, in its many varietals, is quickly becoming very trendy in beverages and this will carry over to yogurt, as well as other dairy foods. Cherries have many recognized health benefits and this is resonating with consumers. Chocolate bits, chips, flakes and pieces, are the trendy inclusion in all types of foods, and yogurt is destined to be next. If the chocolate is dark, it gives consumers permission to indulge, as they accept the fact that dark chocolate is a concentrated source of heart-healthy antioxidants. Greek continues to be the word…but there’s so much more beyond the pint and stick novelty. Think innovative shapes and sizes. In case you missed the Daily Dose of Dairy showcasing Chobani’s new pouch package, you can check it out HERE. This package makes Greek yogurt more portable. This package positions yogurt as an artisan delicacy. 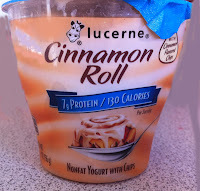 You can almost see it being sampled by “yogurt mongers” in a specialty yogurt section of a grocery store. From Traders Point Creamery, the company showcases its European-style whole milk yogurt in unique 5-ounce glass jars sealed with foil, similar to traditional European yogurt pots. Made with organic milk from strictly grass-fed cows, product labels tout the fact that the grass-fed milk is an inherent source of omega-3 fatty acids and conjugated linoleic acid. Individual pots sell at a premium, about $2.00 each. There are four whole milk varieties--Banana Mango, Plain, Raspberry and Wildberry—as well as a low-fat Plain. For more information, visit HERE. This company wants you to feel what its product can potentially deliver. Designed by food scientists with input from trainers and sport nutritionists, with men as the target consumer, Powerful Yogurt is an all-natural, high-protein yogurt that claims to offer health benefits beyond basic nutrition. The company’s patent-pending packaging has “abs” molded into the cup to communicate to men how the high-quality protein in Powerful Yogurt can assist with building their six-pack. 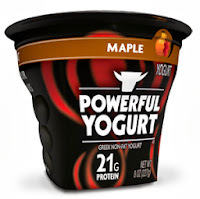 At Expo East, Powerful Yogurt introduced a maple-flavored Greek yogurt, growing the line to seven flavors. An 8-ounce cup, a manly serving size, provides 21 grams of dairy protein. Named “Best Yogurt” earlier this year at the 2013 Dairy Innovation Awards, Powerful Yogurt is differentiated from existing Greek yogurts by its 20 to 25 grams of protein, depending on variety, a serving size that is 50% larger than most individual-serving Greek yogurts, and marketing and packaging that speaks to male consumers and the active lifestyle. For more information, visit HERE. 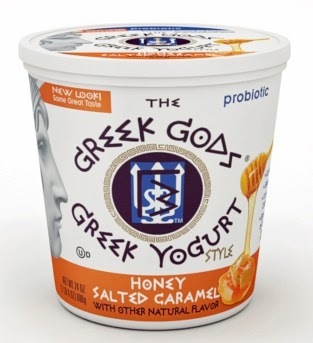 Combining sweet flavors with a savory twist, The Greek Gods brand from The Hain Celestial Group Inc., is introducing Honey Salted Caramel Yogurt. This new flavor comes in a convenient 24-ounce family-sized container. For more information, visit HERE. AtlantaFresh Artisan Creamery has developed a line of artisanal Greek yogurts made from “milk from humanely treated, fully pastured, grass-fed Georgia cows,” according to the company. The product comes in multiple fat levels in a range of flavors, including: Bananas Foster, Black Cherry & Port Wine, Maple Bacon, Peach & Ginger, Strawberry Basil Balsamic and Tropical Sweet Heat. Dreaming Cow Yogurt makes New Zealand-style cream-top (non-homogenized) yogurt using milk from the family-owner’s own grass-fed cows in Georgia. Flavors include Honey Pear, Maple Ginger and Vanilla Agave. For more information, visit HERE. 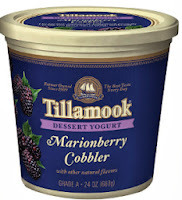 The Tillamook County Creamery Association recently added dessert yogurts to its lineup. The three-flavor line is made with no artificial colors, flavors or sweeteners, as well as no high fructose corn syrup. The dessert line is made with fruits and honey sourced from the Pacific Northwest. Varieties are: Honey Cinnamon Crème Brûlée, Marionberry Cobbler and Peach Raspberry á la Mode. The dessert yogurts come in family-size 24-ounce containers and have a suggested retail price of $4.29. 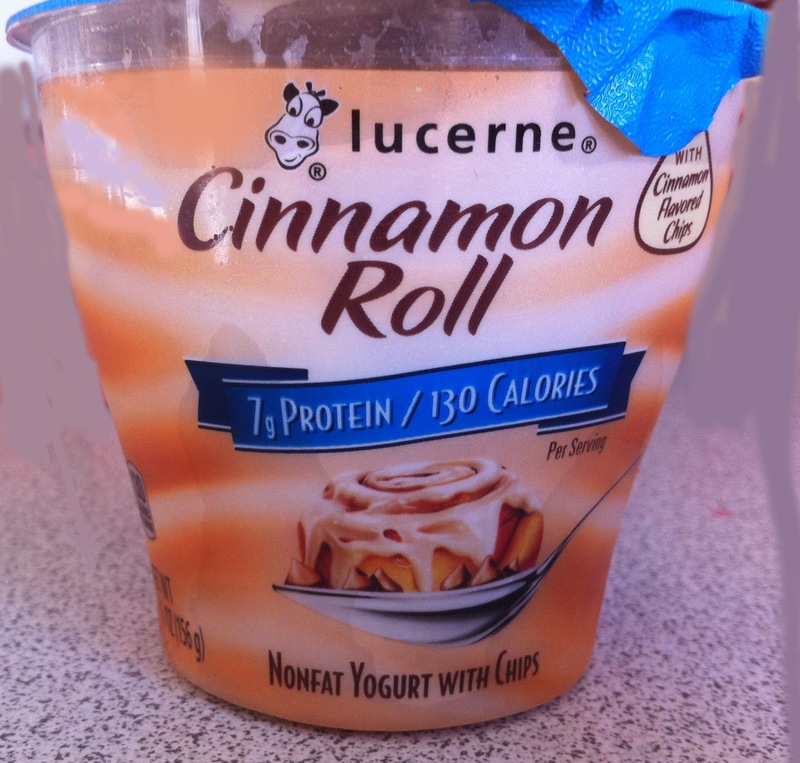 Retail giant Safeway introduces a line of single-serve (5.5-ounce) dessert yogurt cups under its private-label Lucerne brand. There are three flavors: Cinnamon Roll, Raspberry Torte and Strawberry Cheesecake. They are all based on nonfat yogurt and include a cake base flavor as well as flavored chips that deliver an interesting texture. Noosa shows off how its Australian-style yogurt is loaded with premium fruit by packing it in clear containers. For more information, visit HERE. Yoplait places an emphasis on the fruit content of its new Yoplait Fruitful, with each 6-ounce cup containing one-third cup of real fruit. The yogurt also happens to be made from whole milk. Varieties are: Blueberry, Cherries & Red Berries, Mango Pineapple & Orange, Peach, Pineapple and Strawberry. Yoplait is also bragging about everything that its newly reformulated Yoplait Go-GURT yogurt does not contain. That is no high fructose corn syrup, or artificial colors or flavors. 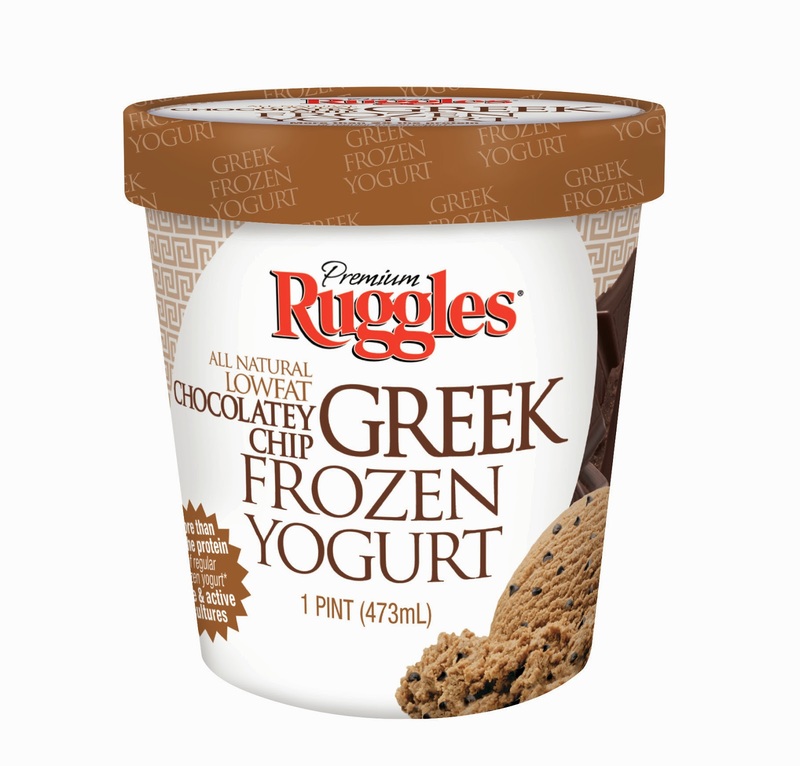 Two new flavors, Raspberry and Chocolatey Chip, join Ruggles’ popular Lowfat Greek Frozen Yogurt line. Ruggles Chocolatey Chip Lowfat Greek Frozen Yogurt is chocolate yogurt with dark chocolate morsels, while Ruggles Raspberry Lowfat Greek Frozen Yogurt features raspberry yogurt with raspberry puree. 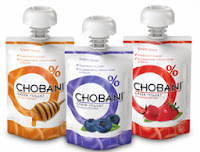 The new flavors join Blueberry, Peach, Strawberry and Vanilla Bean flavors in pints and single-serve 4-ounce containers. The pints have a suggested retail price of $4.99, while the single-serving 4-ounce cups sell for about $1.49. Each single-serving cup also includes a spoon for convenience. 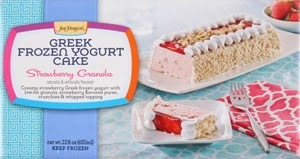 Rich Products Corp., has fashioned a new dessert category with the launch of the first-ever Greek frozen yogurt bar cakes and cupcakes. Frankly, I love having this problem…too many WOWs, not enough space to write about them. This was not the case 20 years ago when I began reporting on how to develop innovative dairy foods. A lot has happened in the past 20 years to better position products made from milk as WOW foods. Think protein, probiotics, and more. 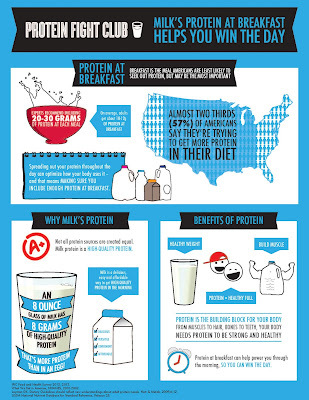 For more information on protein in dairy, read THIS. World School Milk Day is organized by the Food and Agriculture Organization (FAO) of the United Nations. Celebrating its 14th year, the event has grown to become an annual celebration in more than 40 countries around the world with continued growth each year. 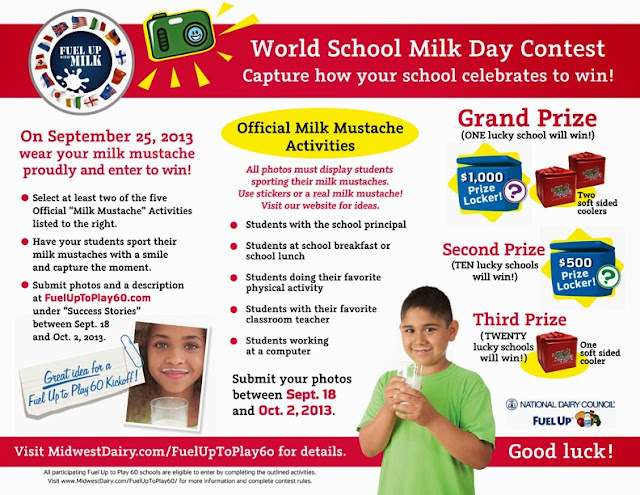 The FAO’s goal is to provide a particular day when attention is focused on school milk and to have all countries celebrating on the same day. The end of the month was selected to allow countries sufficient time to prepare for this day, as in most of the countries surveyed the school year starts in early September. Wednesday was chosen as it was a school day in all countries. This year the celebration takes place on September 25. The celebration is designed to promote the importance of drinking school milk to children in a fun, memorable and educational way. Dairies that provide milk to schools, as well as dairy councils/associations around the world provide schools with materials to celebrate this special day…to celebrate milk’s WOW. The Midwest Dairy Association distributed this flier to area schools. The association has also been working with its processor partners, encouraging them to be a part of this outreach to support World School Milk Day. The Southeast Dairy Association offers a number of downloadable resources to assist schools with their celebration. New for 2013 are grade-specific lesson plans that help educators detail the nutritional benefits of milk. Check out this news broadcast on World School Milk Day HERE. In two weeks, suppliers and top-decision makers of the global retail trade and foodservice and catering markets will be in Cologne, Germany, attending Anuga, the leading trade fair for the global food industry. A central business and communications platform, this biennial event will take place October 5 to 9, 2013. Anuga features 10 specialized trade show segments in one location. The segments are: 1) Bread & Bakery, Hot Beverages, 2) Chilled & Fresh Foods, 3) Dairy, 4) Drinks, 5) Fine Food, 6) Foodservice, 7) Frozen Food, 8) Meat, 9) Organic and 10) RetailTec. For 2013, Anuga organizers have identified 10 trend topics that will be highlighted throughout the 10 segments. They are: 1) Finger Food 2) Gourmet Products & Regional Specialties, 3) Halal Food, 4) Health & Functional Food, 5) Ingredients, 6) Kosher Products, 7) Organic Products, 8) Private Label, 9) Vegetarian Products and – new for 2013 – 10) Products Based on Fair Trade. Anuga Dairy will host around 380 companies, including Alpro, Bauer, Bayernland, Bongrain, Conaprole, DMK Deutsches Milchkontor, Dodoni, Ehrmann, Emmi, Eru, Fage Dairy, FrieslandCampina, Grupo Leche Pascual, Gloria, Heiderbeck, Hochwald, Hoogwegt, Kerry, Luxlait, Nordex, Salzburgmilch, Saputo, Solo Italia, Uhrenholt, Unilac, Valio, Vivartia, Westland and Zanetti. There will also be group participations from Belgium, France, Greece, UK, Ireland, Italy, the Netherlands, Austria, Poland, Switzerland, Spain and Cyprus. Group participations from the German states of Bavaria, Lower Saxony, Saxony, Saxony-Anhalt and Thuringia will also present their consolidated expertise. In other words, Anuga Dairy will provide the world’s most comprehensive overview of the international dairy market. I will be there collecting the latest and greatest on dairy foods that go WOW and will report back to you through the Daily Dose of Dairy. For more information on Anuga, visit HERE. There is no “I” in team, but there is one in “milk.” Thanks to efforts by the California Dairy Research Foundation (CDRF) and the University of California, Davis (UCD), the “I” in milk refers to “international,” and is indicative of the collaborative efforts of researchers and research end-users from around the world to accelerate the understanding of the biological processes underlying mammalian milk genomics…to increase milk’s WOW factor. Dr. Pasin adds, “This October marks the 10th year of the Symposium. We have learned so much in the past decade, but there is so much more to learn about this living, dynamic, personal and structured mammalian secretion known as mother’s milk.” MOM = WOW! In case you missed my article entitled “The uncertain future of probiotics in the United States” published in a September 2013 issue of Food Business News, you can read it HERE. Here’s your chance to help make probiotics a greater WOW with Americans. The International Scientific Association for Probiotics and Prebiotics (ISAPP) posted comments to the 2015 United States Dietary Guidelines Advisory Committee (U.S. DGAC), requesting that the committee consider the value of a diet containing probiotics and prebiotics for reducing disease risk in Americans. Read the probiotic comment HERE. Read the prebiotic comment HERE. A significant show of support for these comments from the scientific community would increase the legitimacy of the comment. To the extent you agree (or disagree) with the ideas present in these comments, posting your concise thoughts with a reference to these postings would be very helpful for getting these comments seriously considered by the U.S. DGAC. The next meeting of the DGAC will be October 3 to 4, so comments should be posted prior to this for greatest impact. WOW! This was an exhausting blog to write. Have a great weekend. Before I discuss coloring dairy foods with natural colors, I am providing you a real-life example of why all of your product development efforts moving forward should emphasize the use of colors exempt from certification. It’s all about Fanta Orange, the States’ version vs. Canada’s. This has been almost a daily topic between me and my almost 14-year-old son…and not generated by me. I find my son’s observations brilliant, and not just because I am his mom. I believe his thought process regarding foods and their ingredients is very reflective of his generation—the kids we are rearing to be foodies. In fact, my son was taught in 7th grade health class that it is smart to avoid artificial colors and flavors. Anyway, during our Labor Day road trip to Niagara Falls, I allowed my son to indulge on his second-favorite beverage, Fanta Orange. (Number-one, of course, is milk.) His first Canadian Fanta Orange was from a chilled can from the vending machine at our Windsor hotel. His second was a fountain beverage, served in a tinted glass at a dimly lit restaurant in Toronto. He slurped up every last drop of both. Because we were heading out to the Maid of the Mist boat ride under the Falls, I tabled the discussion. The next day I casually brought up how the Canadian Fanta Orange contains no artificial colors or flavors. Front panels even explain it is made with real oranges. Still, he was done with it…at least for the next few days. I explained the differences in the formula, which actually surprised me. The U.S. version contains no real oranges and gets its color from FD&C Yellow 6 and FD&C Red 40. He concluded he prefers the Canadian version because it is “less fake.” Now he wants me to start importing the product. He said that it was not nice that the U.S. product had fake colors to make him think it had real oranges. He really has overestimated his mom’s connections. I cannot import Canadian Fanta Orange! In case you missed my last blog on coloring dairy foods, please read about “Coloring Dairy Foods…The Fine Print” by clicking HERE. In general, artificial colorings are manufactured from petroleum-based raw materials. Colors exempt from certification, commonly referred to as natural colors, are obtained from a variety of sources, including plants, minerals, insects and fermentation, resources considered by many to be natural. Some suppliers do differentiate themselves by only providing “natural” colors from fruits, vegetables and plants. Many natural colors are available in organic formats, as well as can be designed to be oil soluble. Check out the following color chart to see the range of hues that can be obtained with natural colors…and some that will be attainable in the near future. Unlike other “natural” blues in the market, which are fruit-juice based and categorized as such, spirulina extract now has its own separate regulation. It can be viewed HERE. As of now, spirulina extract has not been approved for use in dairy. But, wow, look what it can do in ice cream and yogurt. According to The Health Professional’s Guide to Popular Dietary Supplements, third edition, a desk reference published by the American Dietetic Association, spirulina is one of many forms of blue-green algae. It is a multicellular organism that grows wild in highly alkaline lakes. Its characteristic blue-green color is due to its chlorophyll and phycocyanin content. These pigments have been studied for their potential anti-inflammatory, antioxidant and antiviral properties; hence the reason spirulina has long been tabletted and sold as a dietary supplement. Spirulina is considered an edible plant. In many countries, especially throughout Africa, spirulina are harvested and dried into cakes that are served as a center-of-plate protein, often with flavorful sauces. Dried spirulina contains 60% to 70% protein, 10% to 20% carbohydrate, 9% to 14% lipids, 4% nucleic acids and 6% ash. In many countries, spirulina is considered a superfood, even in the States. Inventure Foods Inc., recently introduced Jamba Green Fusion fruit and veggie smoothie. It’s the latest in a long line of frozen at-home smoothie kits developed by the Phoenix-based company, in partnership with smoothie retailer Jamba Juice Co. Green Fusion combines green apple, mango, pineapple, kiwi, banana, broccoli, spinach and spirulina to offer a sweet, yet hearty smoothie appropriate for morning commutes, post-workout recovery or a better-for-you snack. Protein was the buzz at the 2013 Institute of Food Technologists (IFT) Annual Meeting + Food Expo in Chicago this past July. For the most part, ingredient suppliers were showcasing their isolated protein ingredients for use in all types of foods and beverages, as formulators are aggressively trying to boost protein contents in order to make protein content claims…one of the hottest trends in the world of food and beverage marketing. The great news for fluid milk marketers is that an 8-ounce glass of milk inherently contains 8 grams of high-quality, complete protein, making it a good source of protein by delivering 16% of the Daily Value. The protein in milk is a blend of casein and whey and contains all of the essential amino acids in the proportion that the body needs. Earlier this year I wrote a blog entitled: Protein for Breakfast--and When They Are Dairy Proteins, You Get Better Benefits. You can view it HERE. MilkPEP agrees that milk proteins are the best way to start the day and wants to communicate this to Americans. On August 21, MilkPEP launched a brand new program designed to drive awareness of milk’s high-quality protein. Built from in-depth research that identified the impactful power of the milk protein message, MilkPEP’s new Protein Fight Club program is designed to motivate behavior change and spur milk consumption at breakfast…the most important meal of the day. At IFT, Chicago-based market research firm Mintel presented “Protein: Is it the Next Big Thing?” The answer is yes, according to Lynn Dornblaser, director-innovation and insight with Mintel. She explained to IFT attendees that more than two-fifths of U.S. consumers say they don’t drink energy drinks because they “don’t seem safe,” opening the door for other ways to provide an energy lift. “And that energy is in the form of protein,” she said. Protein’s “sustained energy” is more appealing than the “fast energy” one gets with carbohydrates and caffeine. She explained that among all new food and beverage introductions in the past year, dairy leads with the number of protein claims. 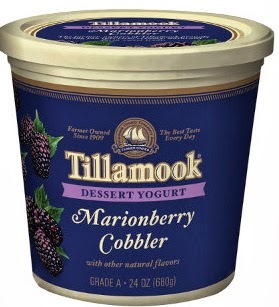 “This is being driven by the popularity of Greek yogurt,” said Dornblaser. Because it resonates with consumers that dairy foods contain protein, the time is right to make sure that consumers understand that the same great high-quality protein that is in Greek yogurt and other dairy foods is in a glass of milk. The main message of the Protein Fight Club campaign is that the way for consumers to win their day is by starting each morning with milk. 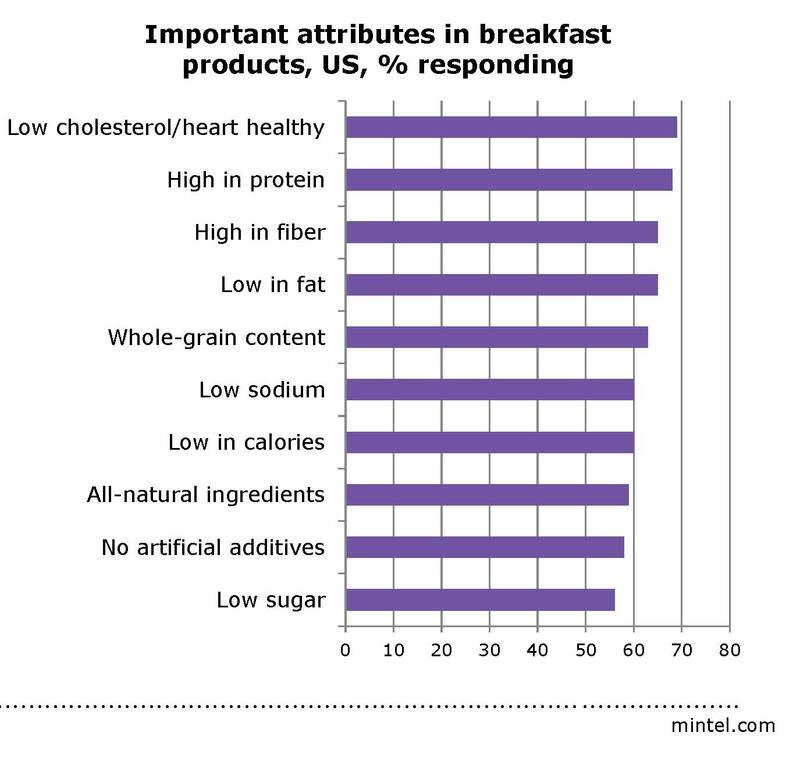 The multi-media campaign elevates the protein in milk as a competitive advantage over orange juice and other common breakfast items. The campaign includes a series of eight videos that communicate that there are 8 grams of protein in each 8-ounce serving of milk. It puts the spotlight on protein by depicting milk in a series of humorous breakfast battles that showcase how milk’s protein stacks up against the competition and can help win each day. The Protein Fight Club campaign is also helping Americans win their own breakfast battles with a promotion that gives away a free gallon of milk every minute for eight weeks, and giving one person each week a chance to win free milk for a year. The promotion--at www.GotMilkGotProtein.com--is designed to encourage Americans to get into a healthy routine by starting each morning with milk’s high-quality protein. MilkPEP members have access to the Protein Fight Club Playbook, which includes an array of marketing materials that can be customized for their brand, as well as downloadable marketing materials for digital and social programs and materials that can be ordered for retail merchandising. If you would like to learn more about accessing the Protein Fight Club assets and materials, please contact Melissa Malcolm at mmalcolm@milkpep.org. The fact is, almost two-thirds of Americans say they’re trying to get more protein in their diet, according to the International Food Information Council (IFIC) Foundation’s Food and Health Survey 2012, 2013. Yet, most people underestimate the importance of both getting protein at breakfast and the protein prowess of one of breakfast’s most popular staples: milk. When it comes to an affordable, convenient, great-tasting morning protein that packs a serious punch, other breakfast options simply can’t match the power of milk, according to the campaign. 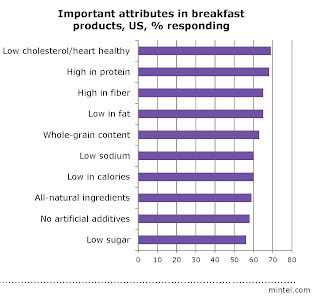 While many Americans are looking to add more protein to their diets, breakfast is the meal they are least likely to seek out this important nutrient, and, yet, it may be the most important. Experts recommend including 20 grams to 30 grams of protein at each meal rather than in one large amount, but research shows that most adults are getting only 10 grams to 12 grams of protein at breakfast. From muscles to hair, bones to teeth, the body needs protein to be strong and healthy. Milk is a natural source of high-quality protein to build muscle, calcium to strengthen bones and B vitamins for energy. 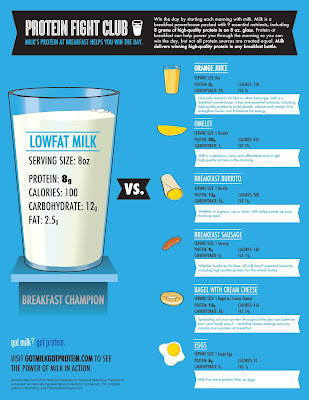 Milk is a breakfast powerhouse, packed with nine essential nutrients in each glass. “Whether in a glass, cup or bowl, milk with breakfast is a delicious, easy and affordable way to help power you through the morning so you can win each day,” says Grotto. 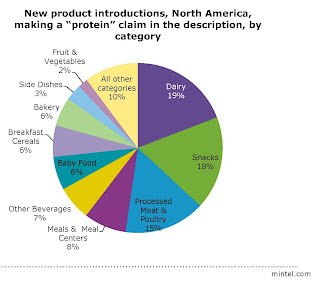 David Wright, senior manager-marketing with The Hartman Group, Bellevue, WA, sums up the trend of protein in the morning. “Among ingredients sought for health benefits, protein is high on the list of consumer priorities because it’s typically seen as filling and relates to notions of satiety,” he says. “Consumers also equate protein with energy, which is why consuming protein for breakfast is a great way to start the day. Milk…It starts the day off right!